Outrage at Gillard’s announcement of the Pacific Solution 2.0 was a feature of rallies in both Perth and Brisbane held on August 26 to mark the 10th anniversary of the rescue of 433 asylum seekers by the Norwegian ship the MV Tampa in 2001. The turning back of the MV Tampa also marked the beginning of the Pacific Solution 1.0 under John Howard. Ironically, almost ten years to the day, Julia Gillard announced the Pacific Solution 2.0, and that any boat arrivals from August 13, 2012 would be sent to Nauru for processing. 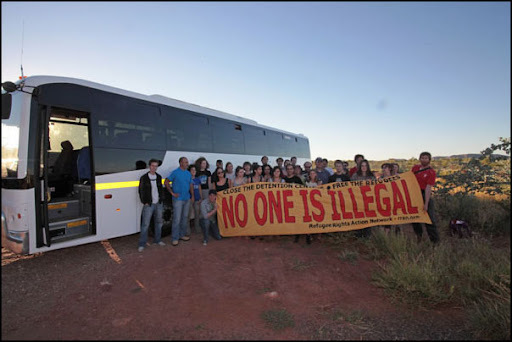 In Perth, 150 people took the one and a half hour journey to Yongah Hills Immigration Detention Centre to rally at the newly-opened immigration detention centre just outside the town of Northam. The big turn-out, with contingents from University of Western Australia and Curtin University was clearly a response to Labor’s latest policy shift. Greens Senator Scott Ludlum addressed the rally in the car-park of Yongah Hill saying that the struggle for refugees needed to be won, not in parliament, but “in the street”. Indeed following the protest the Refugee Rights Action Network received word from inside Yongah Hills that detainees had heard the protest and knew people were outside in support. They expressed their sincere thanks for that. Meanwhile, in Brisbane, around 150 people rallied and marched through Brisbane’s streets. Along with the Greens and a Tamil speaker, the rally heard from Ahmad Hamid, a Brisbane representative of Ahwazi Arabs, a persecuted Arab speaking minority from the south-west of Iran. A group of Ahwazi Arabs were among the first asylum seekers to arrive on Christmas Island after Julia Gillard announced the Pacific Solution 2.0. More rallies are going to be needed as the refugee movement faces up to Gillard’s attempt to re-impose the off-shore processing policies of the dark days of the Howard years. Thank you for giving time to representative of Ahwazi Arabs as he could explain our situation in Ahwaz and he also said why people are comming to Australia . Other racial minorities in Iran are also in similar situation.